George Coleman, a caretaker at the Tobacco Caye Lodge, has been missing since Tuesday, and friends and family are worried that they may not find him alive. Tobacco Caye is an island off the coast to the east of the Stann Creek District. Getting there takes about 20-30 minute by boat from Dangriga Town. That's where Coleman, who we are told is in his late 50's, lived most of his life. The last time he was seen or heard from was on Tuesday. That's when he went diving for conch, right in front of Tobacco Caye, without a vessel. Since then, he has not returned to the island. Nobody knew that he was missing until Wednesday, and the concern is that this very experienced seaman may be in trouble, or he may have passed away. Those closest to him suspect that he may have gone down too deep, and he couldn't make it back to the water surface. They are hoping to find him alive, but they are cognizant that by now, someone would have seen and said something. His friends tell us that they are dissatisfied with response from law enforcement. They say that the missing person's report for George Coleman was made on Wednesday, and since then no police, and no Coast Guard showed up to help look for him. They say that officers from the Fisheries Department did show up, but they didn't contribute much to the search efforts. Anyone with information is asked to call Jerome Gill at telephone number 663-2087, or the Tobacco Caye Lodge at 503-2033. Last Week Friday, we told you about the missing persons case of George, the Caretaker from Tobacco Caye, which is to the east of Stann Creek District. Well, his body was found, confirming the worst fears of his family and friends that he drowned while out on a dive. 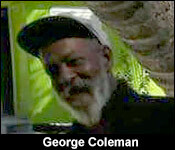 He was identified to us as George Coleman by his friend, but police say that his name is George Stewart. AS we reported, he was last seen on Tuesday, when he went diving for conch right in front of Tobacco Caye without a vessel. He didn't return, and so on Wednesday, his friends and family began to worry about him. The concern was that this very experienced seaman went down too deep, and couldn't make it back to the surface. On Friday evening, at around 6:10 a body was found in the Cat Caye Area off the coast of Stann Creek. It confirmed later that night that indeed it was George, and that he drowned. An impromptu postmortem was held due to the advanced state of decomposition, and he was immediately buried after that.